Sitting at the bar with a margarita at St. Thomas' most famous beach, Magen's Bay, it's hard to believe that this popular spot was nothing but debris and flattened trees just two months ago. Hurricane Irma made landfall on the island early September, with winds the bartenders say reached up to 225 miles per hour. Yet, the beach is pristine, and everyone working is smiling and full of positive energy. The return of cruise ships to St. Thomas has been a beacon of hope for the locals. Tourism is the island's largest and most crucial economy; they need it to help them recover. MSC Divina, the cruise ship we're on, is one of the first mainstream lines to call at Charlotte Amalie (St. Thomas' main port) since the hurricane. Back at the bar, the music is being powered by a generator. With the exception of the port area and main tourist hubs, much of the island is still without power. Our bartender Nelson tells us they expect 70 percent of it to be back up and running by Christmas. He adds that despite the hardships at home, he and other residents are happy to be back at work. 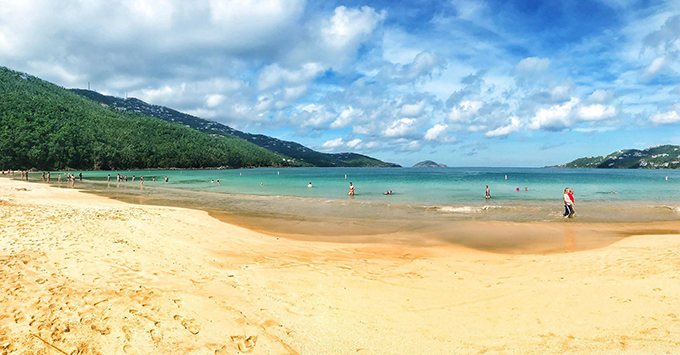 One of the Caribbean's most popular beaches greeted us with a familiar backdrop: blue skies and lush, rolling hills dotted with colorful homes. The sand was soft and clean, and the water was crystal clear. Appearance-wise, the biggest difference is the scarcity of vegetation along the beach; trees that could not be salvaged had to be removed. Replanting efforts are still underway, but most of what's being worked on is far enough away from the main area of the beach, you might not even notice. Nevertheless, the beach everyone knows and loves feels more alive than ever -- with ice-cold drinks, delicious food off the grill, and good company. 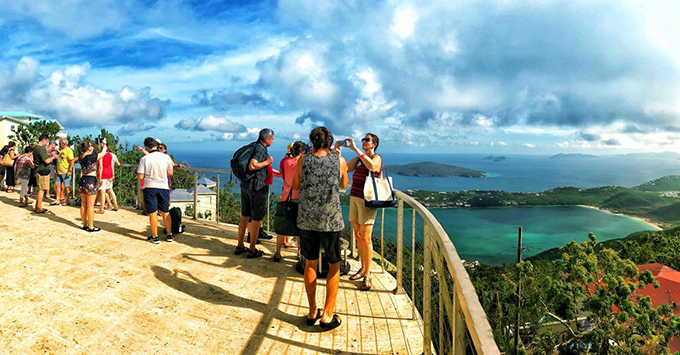 The highest peak in St. Thomas still offers the same breathtaking views of Magen's Bay and the distant British Virgin Islands. The store is back up and running, too; however, a portion of it is taped off from goods that were damaged during the hurricane. There's also obvious damage as you wake your way up the hill -- such as a crumbled satellite tower and a few downed telephone poles -- though nothing that made us feel unsafe. Our guide was very open to pointing out the damage, while stressing recovery is still in full force. 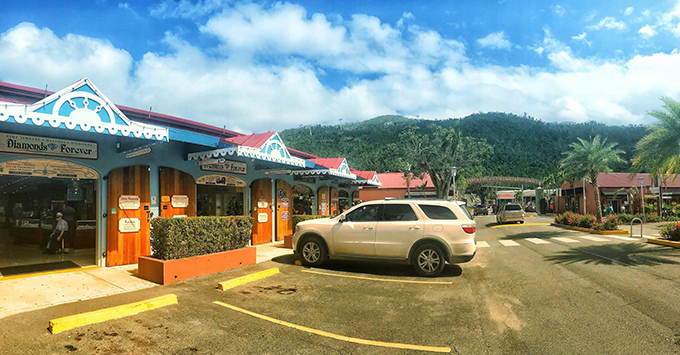 Charlotte Amalie's main shopping district stretches from the Havensight Mall (right by the cruise ships) to Kongens Quarter, the historic downtown. This area was the first of only a few to have power restored, because the same underground lines are connected to the city's hospital. Just about all the stores are structurally intact and operating normally, and none that we noticed were still housing hurricane-damaged goods. We barely saw any heaps of trash or fallen branches (prevalent on the outskirts of town). It's evident a lot of work was put into the main attractions to get them in top shape for the cruise ships' return. Cruise Critic is surveying the Caribbean, checking in on our favorite cruise ports. Got questions? Ask us in our live forum. 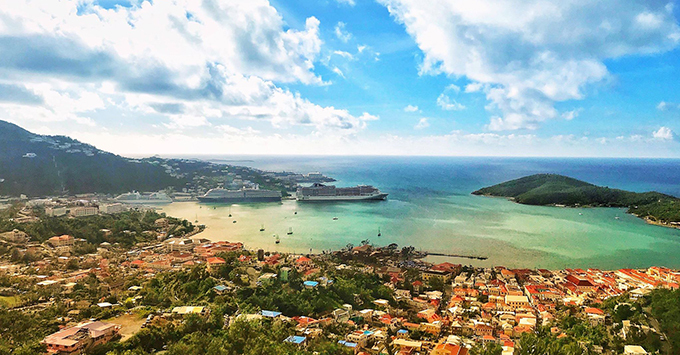 And visit our Caribbean Cruise Update page for more information, including which ports are open, the latest deals and what other cruisers are saying.